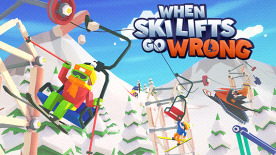 A skiing themed constructions game packed full of creative challenges and hilarious disasters. Build Chairlifts, Gondolas, and Jumps then guide your skiers and snowmobile drivers across 70+ hazardous levels. Construct ski lifts, jumps and bridges from a range of materials to transport your passengers through each level. Master the rope physics and the stresses and strains it will put on your constructions. Cutting corners along the way will compromise the safety and comfort of your passengers. When design alone isn't enough, turn to your skiing skills to get that extra nudge towards your destination. Travel the world's mountains; start in the rolling foothills and journey up to the jagged and exposed peaks. Puzzle over carefully designed scenarios to help skiers reach their destination in a variety of mountain backdrops. Build increasingly impressive structures as you progress through the varied campaign, but keep an eye on your budget! Create your own puzzles in the easy-to-use level builder where only your imagination is the limit. Customise the puzzle with the slope editor, then bring it to life with the procedural mountain generation tool and your choice of scenery and settings. Combine chairlifts and gondolas in a single level to reach the highest peaks, or construct the terrain park of your dreams to practice your skiing tricks. Share your proudest and most audacious replays with the community. The inbuilt gif and mp4 exporter makes it easy to share your replays and creations online. Or take to Steam Workshop to test your engineering skills against the rest of the community.